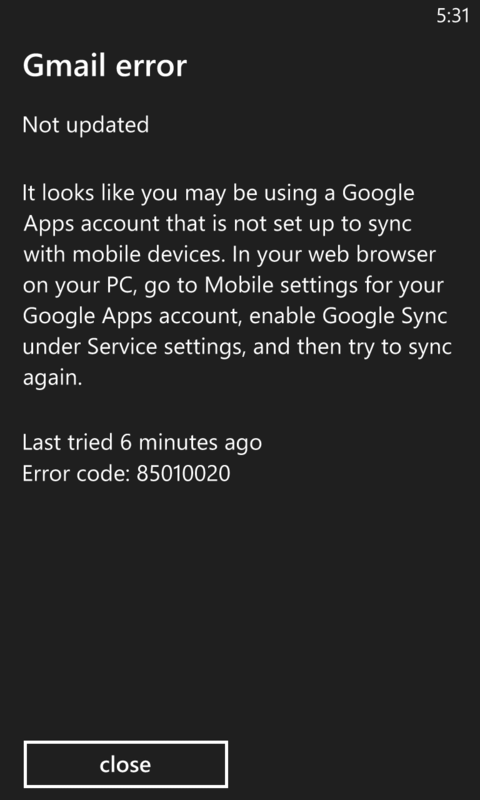 Looks like its because your Google Apps account hasn't set up ActiveSync. This isn't a person Gmail account is it? That's the problem. I don't know what the heck that is. I don't use the web interface for gmail and searching through the settings on it yielded no results. What is this google apps they speak of? Sorry, I was actually trying to be helpful. What i meant to ask was if you had a personal Gmail email address (ie: brandon@gmail.com) or a Google Apps address (ie: brandon@website.edu). Google Apps addresses are usually businesses or universities that use Google as the backend for their email servers. lol ok. Nah it's a personal address. xxxxxxxxxxxxxx@gmail.com, which is why I am confused. The settings I used were what was posted, but I had all 4 checkboxes selected, email, calendar, contacts and tasks. I got this message when I tried to set up more than 1 personal Gmail account on my phone. What fixed it for me was to remove the account (long press and "delete") and re-add it again. If you're getting that error, it means you've at least set up the account correctly (username, password, server address, that is). I would try to readd it and see if that works. Could the problem be because I have enabled IMAP in gmail settings (on the gmail web account itself)? I don't see why that could cause it. This may not be the most desirable solution but it does work. Get yourself a Hotmail account or whatever they call it now. Have Google forward all of your mail to this new address. Have WP sync to the Microsoft account you have setup. Microsoft wants you to use there ecosystem. It will always work better than interfacing to another's system. If it's a personal Gmail account then I don't believe you can set it up through ActiveSync. I compared my personal Gmail account with my Google Apps account and the option to enable ActiveSync is only available on my Google Apps account. To set up my personal Gmail account on my 8X I went into email + accounts -> Add an Account -> Google. Yeah I was doing this on my 900, but then I discovered that Gmail supports ActiveSync. This makes the most sense but then how are other people with personal Gmail accounts doing it? The issue lies with Google. They have tweaked they IMAP2 protocols so much for Android, that when you try to use any other STANDARDS based application, you have tons of issue. They have optimized Gmail for the Android experience, so I would suggest migrating to another mail service. I do use hotmail, live, outlook. I'm a man of many emails, Microsoft is my primary though. I'll just set it up as imap then. Google can sod off. That's exactly what I did. I've tried several variations of such as well. Why are you talking about IMAP, when this thread is about exchange. WP8 has problems, when you set your gmail as IMAP, but has zero problems when you set it via exchange. That's not entirely true. I woke up this morning to having no emails. I thought it was strange because I get a lot of emails. I checked my Nexus 7 and I had 11 new emails. I tried to force an sync, but still no update. Finally I rebooted the phone and then updates came through. I'm not sure if it's related to the bug mentioned above. And yes, I'm using gmail exchange. I finally caved and set it to imap with syncing only emails. I can't stand gmail's web interface anyways so I don't use calendar and tasks with it.